It all starts when you finally move your family out of the bustling city and move into a nice farmhouse in the rural outskirts of town. Then, you decide to get a couple chickens so you can have farm-fresh eggs every morning. Next thing you know, you try your hand at growing your own vegetables. Then, of course, you want to make your own goat cheese, but you don’t want to simply buy goat milk at the store — that’s absurd! So, you get a couple goats. Then your friends start inquiring about eggs. To keep up with demand, you get some more chickens. Then they want in on this fresh goat cheese you keep raving about. So you buy more goats. And you plant more cucumbers and kale. And you buy even more chickens. And you purchase the plot of land next to your home because there simply isn’t enough space. Before you know it, you start to suspect that you’re running a fresh food business that can become more than just supplying your close friends with eggs and vegetables. If the above situation sounds a little familiar, that’s because for many of you, it is. It doesn’t take acres and acres of land to start a small farm business. But it does take a little bit of planning and the right tools. At Delivery Biz Pro, we love helping small businesses like yours expand your audience by giving you the home delivery software you need to make recurring deliveries of fresh produce, eggs, dairy, and any other goodies you grow on your farm. Keep reading to learn more about starting a small farm business and how the right farm delivery software can keep you running smooth! It might be time to start your own business. Many people who begin with hobby farms and homesteading eventually move into the world of CSAs, or community-supported agriculture. A CSA is a share-based farm-to-home service that provides the local community with fresh produce, milk, eggs, meat, and other farm items. Some CSAs operate on a pick-up process, where customers come to your farm to pick up their items. However, it is becoming more popular for CSAs to offer home delivery for their customer’s convenience. CSAs require a customer base to buy into your service and pay up-front with the promise of quality deliveries of fresh food throughout the growing season. This means that organization is key to ensure that everyone gets what they paid for. It also means you will need an online presence to convince people to sign up for your CSA. Delivery Biz Pro helps with all of that, from keeping track of customers to routing your deliveries in a logical manner. With our system, you can see who has paid and who hasn’t, who has crates and ice boxes that need to be returned, who wants to cancel this week’s delivery because they’ll be out of town, and so much more. All of this is nearly impossible to keep track of on your own, and if you try to do all of this without an industry-specific software, you’ll end up with a mess of spreadsheets and a lot of confusion. To start a successful CSA, you will need to make sure to comply with all state and local laws regarding food handling, storage, and distribution. Some states require you to register your CSA with the government or obtain a business license. You can contact your state and local departments of agriculture to inquire about specific legislation around CSAs in your area. 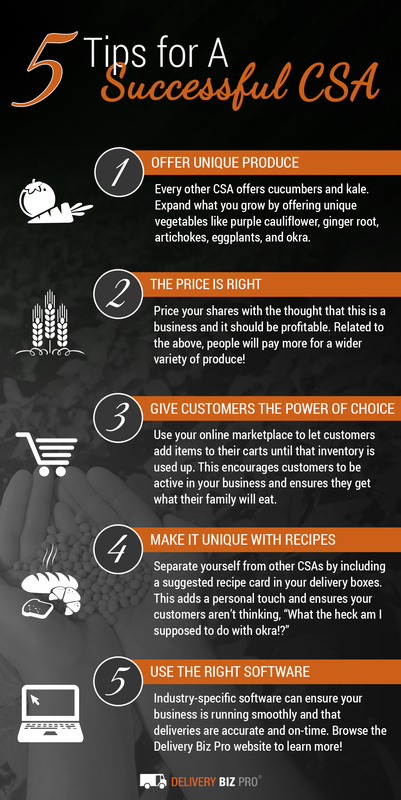 We’ve compiled five tips for running a successful CSA in the infographic below! Be sure to keep reading to learn more details about these important factors. When someone subscribes to a CSA, they are making an investment in something without truly knowing what the outcome will be. For this reason, it is important to make the CSA worth your customers’ time and money by offering a wide variety of products. Cucumbers and lettuce are great, but if you can include other farm-fresh produce like strawberries, carrots, onions, tomatoes, zucchini, squash, cauliflower, broccoli, peppers, apples, peaches, and green beans, your customers are going to have a wider variety. You can also take your products and make things like organic ketchup, fruit preserves, honey, and cheese so they are getting more than just produce. The goal is to give them enough variety in their produce that they don’t have to make a trip to the store. Pricing for a CSA can get a little complicated. You want to ensure it’s “worth it” for both you and your subscribers. If the share prices are too high, your subscribers will feel like they’ve been taken advantage of. If it is too low, you will not be able to profit from your business when you take into account the price not only of soil for the vegetables and the feed for the chickens and goats, but also of price of the refrigerated delivery boxes and CSA software. However, people pay for quality food and service. The more reliable your delivery service is and the higher-quality your products, the more people will be willing to pay. Everyone knows that you can get a dozen eggs at the store for $1.89 and a gallon of milk for less than $3.00. However, customers looking for fresh local produce aren’t looking for the cheapest way to feed their family. They are interested in fresh food without GMOs or hormones and free-range eggs with bright orange yolks. They buy local because they want the best, so they will be willing to pay more than you might think. You might be thinking, “How am I going to have the time to run a farm that feeds X number of people?” Going to providing produce for your close friends and family is one thing, but the more people you serve, the bigger your farm will be, and the more hands you will need to maintain it. However, before you hire someone, consider offering CSA discounts for members who pledge to help out. This not only helps to build a community, but saves you and your customers money. Include recipe cards and meal ideas with each week’s delivery. These don’t have to be super fancy, but helping your customers know there are multiple ways to use their produce can ensure that every last leaf is used and nothing goes to waste, again showing your customers that your CSA is worth the investment. 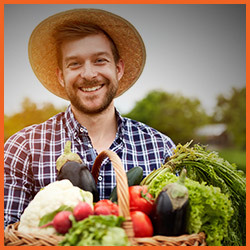 Our produce delivery software can be customized to fit your exact needs and desires for your small farm. You have control over what your customers can and can’t do to ensure there are no surprises on the delivery day. The DBP software also ensures routes are clear for your drivers and empowers them to provide the same service to your customers that you do. Delivery Biz Pro is your top choice for CSA management software. 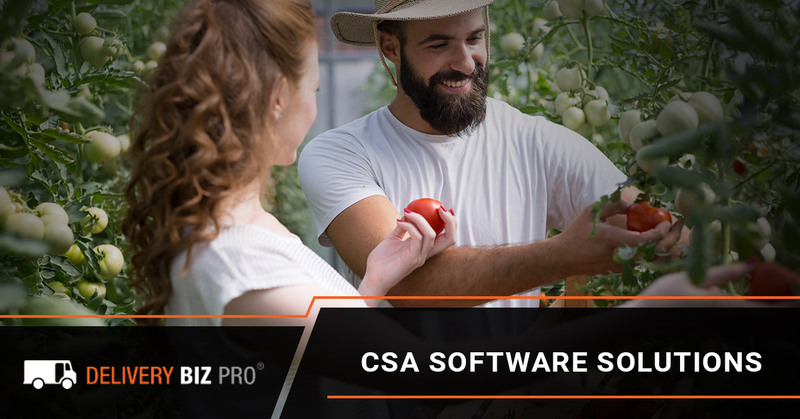 This small farm software helps local CSA owners provide their customers with the best and most reliable service year after year. When you choose DBP, you get more than just our produce delivery software. We will help you build a beautiful online marketplace where customers can sign up for your service. Our websites are completely customizable and designed for your industry. For example, you can decide if you require all dues upfront or if you will allow payment installments. Our websites are mobile-friendly, so regardless of which device your customer is using, they will be greeted with a functional and aesthetic website. On your online marketplace, your customers can choose what gets delivered each week and manage their subscriptions. Because they have already paid their dues to your CSA, they can sign in and add certain items to their carts. If you have only a limited amount of a product, you can update your inventory on the site and customers will be met with an “out of stock” notice when that item is spoken for. We also make it easy to send out emails and promotions to your customers so they know what produce is going to available next week or learn new ways to cook certain items. You can also post one-time items that might not be included in a produce box. For example, if you keep bees, maybe you want to give your customers the option to purchase honey, beeswax soap, and other bee products to have delivered with their recurring box that week. When it is time to make deliveries, our delivery routing software will add your customers to a route based on certain specifications. Maybe you have a customer who only receives a delivery once a month rather than every week, or you deliver to one side of town on Tuesdays and the other side gets their orders on Thursday. However you decide to route your drivers, our software makes it truly simple. Your drivers can check off when a delivery has been made, send your customers a delivery confirmation text or email, and even account for crates or ice boxes that have been returned to you or are outstanding. Our software can also generate multiple graphs and charts to show you exactly where your business stands on any given day, making it easy to know if you are profiting and by how much, which products are pulling your customers in, and so much more. Basically, we have created this software to be tailored to your business and easy to use. After all, we don’t expect you to be a software expert — that’s our job! We just want to make your job easier for you and your customers. In order to run a successful CSA, you will need a way to keep track of orders, customers, payments, and delivery routes. 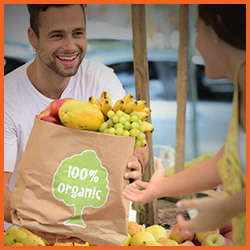 Our intuitive and customizable farm delivery software takes the guesswork out and makes all of the logistics simple and easy to understand so you can focus on growing healthy food for your community. When you work with DBP, you will have access to our software as well as our design and development team. That means if there is ever a problem with your CSA software, we’ll get to the bottom of it. We take care of software updates, keep your data secure, and backup your date twice daily so if a calamity happens, you won’t lose all of your important information and hard work. We currently host nearly 7,000 fresh, local, and natural farms and suppliers in our system, who combined offer over 70,000 products to their customers, and our software alone ensures that over 600,000 deliveries get to where they need to be every single week. What this all means is that we’re not new to the game. We have developed a tried and true home delivery software (and continue to develop it based on your needs and feedback) in order to ensure your business is running as smoothly as possible. If you are interested in using our farm delivery software for your business, then take twenty seconds to fill out our CSA software application and we’ll figure out a time to get in touch and chat. You’ll notice that we have an “application” rather than a big ol’ button that says “buy now.” This is because we want to make sure your business model and our software will be a good fit before you make an investment. After all, when you’re happy with your software, we’re happy — and, more importantly, your customers are happy! Get in touch with Delivery Biz Pro today to see if our CSA software solution is right for your business!